The Topps Company, Inc. (www.topps.com) owns the Shadowrun intellectual properties. 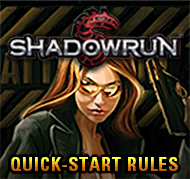 What is the policy for Shadowrun fan web pages? 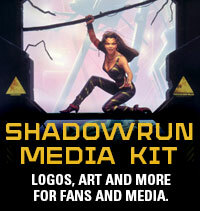 The Topps Company, Inc. has sole ownership of the names, logo, artwork, marks, photographs, sounds, audio, video and/or any proprietary material used in connection with the game Shadowrun. The Topps Company, Inc. has granted permission to < fill in the name of your site > to use such names, logos, artwork, marks and/or any proprietary materials for promotional and informational purposes on its website but does not endorse, and is not affiliated with < fill in the name of your site > in any official capacity whatsoever. 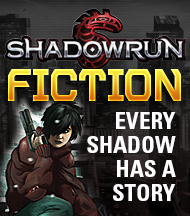 Copyright – It is not permissible to post published copyrighted Shadowrun material, writing or artwork, in whole or in part, on your web pages, without the prior written consent of The Topps Company, Inc..
Commercial use – It is not permissible to sell any product or service that utilizes any aspect of the Shadowrun universe including but not limited to, characters, logo, artwork, marks, and/or any proprietary material, without the prior written consent of The Topps Company, Inc..
What can I do with stuff I download from Shadowrun4.com? Feel free to download and print the material out for your friends and gaming group. Please preserve the copyright notice at the bottom of each page, and do not upload the files to other internet sites – if your friends want to get their own electronic copies, please point them here. This helps ensure that they’ll always get the most up to date files!